Starry nights, sunny days, lightning storms, and rainbow rays. Do these lighting phenomena exist in the spiritual world like they do on earth? 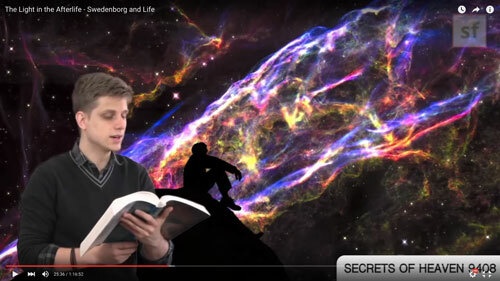 In this episode of Swedenborg and Life, host Curtis Childs and featured guests review Swedenborg’s written records about his spiritual experiences as well as modern accounts of near-death experiences to see what they can tell us about the form and function of light in the afterlife. Curtis kicks off this episode by referencing a previous show called Spiritual Light that focused on the correspondences between light and truth in the physical and spiritual worlds, which serves as a contextual foundation for this episode. In this show, the focus is on the specific ways light is manifested in the spiritual world according to Swedenborg’s vivid and detailed reports. With that said, we can dive in to how Swedenborg described clothing and atmosphere in the afterlife. To provide context for Swedenborg’s descriptions, Curtis describes the experience of synesthesia, in which you might experience a sound as a color, for example, or a smell as a physical sensation. Curtis also shares a quote from Eben Alexander’s Proof of Heaven where the author describes the connection between sight, sound, and sensation in the afterlife. To expand on Alexander’s point, a special guest of the show reads a quote from True Christianity where Swedenborg describes the visual and sensory nature of the clothes in heaven. 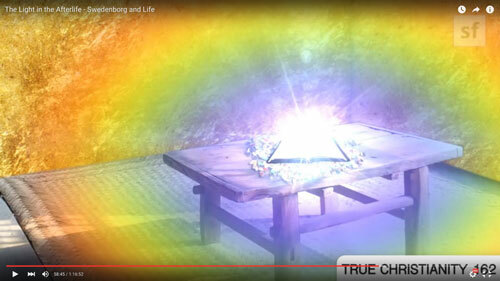 Swedenborg not only described how clothing responds to different spirits and occasions in heaven, but he also talked about rainbows in great detail, as you can see from this animated Secrets of Heaven quote. At the beginning of the show, Curtis asked how light can exist in the spiritual world when it’s tied so closely to scientific constructs in the physical world. 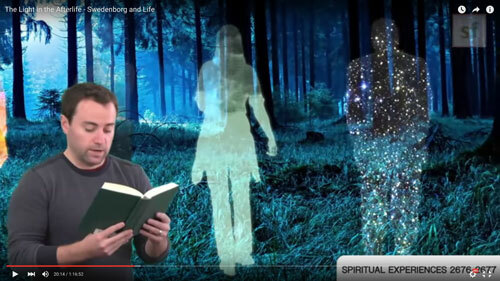 By the end of this first segment, we can start to see that Swedenborg is trying to explain how closely related the spiritual and physical worlds are—and how the spirits of those who’ve passed on from the physical world create the afterlife through the emotions and states of mind they bring with them from earth. Swedenborg often describes stars around spirits in the afterlife. Fixed stars can represent goodness and truth in wise angels, while wandering stars around a spirit can represent a need for more knowledge. In addition to stars appearing around spirits, spirits can also appear as stars, as Swedenborg explains in this animated quote from Spiritual Experiences. From this we can see that the character of a spirit is completely transparent because of the light that they radiate in the spiritual world. In the physical world, stars appear in the sky, not around people. Did Swedenborg see stars in heaven’s sky? Why, yes he did! The appearance and purpose of stars in the spiritual world, however, are very different from their form and function on earth, as explained in this animated clip from Secrets of Heaven. You might be picking up on the fact that everything in Swedenborg’s theology includes meaning and symbolism—and you’d be right! To accentuate this point, Curtis introduces another quote from True Christianity where Swedenborg recounts a conversation he had with some spirits about the symbolism of the number of stars in the sky. In Swedenborg’s accounts of the afterlife, he describes lightning as an educational tool, and he even shares a specific story about a wise spirit who was teaching others spirits about the importance of marriage love when lightning appeared. In addition to its educational use, lightning can also appear during a clash of ideas, as described by Swedenborg in True Christianity. 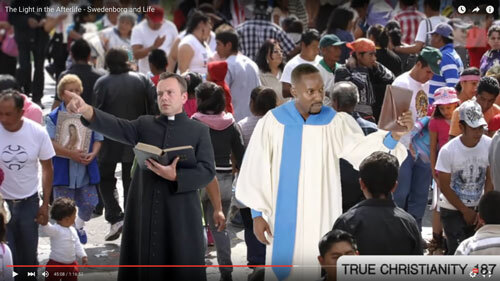 Curtis explains that one of the unique characteristics of the spiritual world is that it’s composed of transparency and honesty. On earth, humans can cover up their intentions and emotions, but in the afterlife, that’s difficult to do. Light is an essential and useful part of the spiritual world because it’s used to communicate truth. Curtis reads an excerpt from Heaven and Hell to explain how light reveals truth, which sets up a visually intriguing animation based on Swedenborg’s ability to see spiritual light and truth shined on scripture. After his spiritual experiences allowed him to see the inner meaning of the Bible, Swedenborg believed that church leaders and their doctrines did not accurately share the truth of the Lord’s love and wisdom from scripture. Just as Swedenborg believed that everything in the physical and spiritual worlds contains symbolism, he believed the Bible was full of hidden meaning, which he calls Divine truths. Curtis introduces a series of excerpts from Swedenborg’s Sacred Scripture to explain his spiritual philosophy of the Word. One of the main issues Swedenborg had with the Christian church of his time was that they were taking pieces of the true Word and using them to spread evil and falsities. In this fascinating excerpt from True Christianity, Swedenborg recounts a spiritual experience where he witnessed angels and spirits discussing our misunderstanding of the Bible in the physical world. Swedenborg revealed his concerns about the misrepresentation of the Word in the eighteenth century. Do you think we’ve become better or worse at letting the light of goodness and truth shine through religious texts? Learn more about Swedenborg’s interpretation of the Bible here. Related Swedenborg and Life videos: What the 7 Days of Creation Mean, The Modern Cain and Abel, The Meaning of Adam and Eve. How can we do what Swedenborg Does? What does Swedenborg say about intercessory prayer: praying for others? Why is there mental illness? Not touching the words in the afterlife, or twisting the meanings of God’s Word, what does that related to in the physical world? How does God use light to guide us toward good living? If we want to do good, but don’t know what is the best way to do good. Does our imagination create things like God does? Does Swedenborg say anything about forgiveness? Do these evil spirits that attack—are they around us? I really don’t want them around!